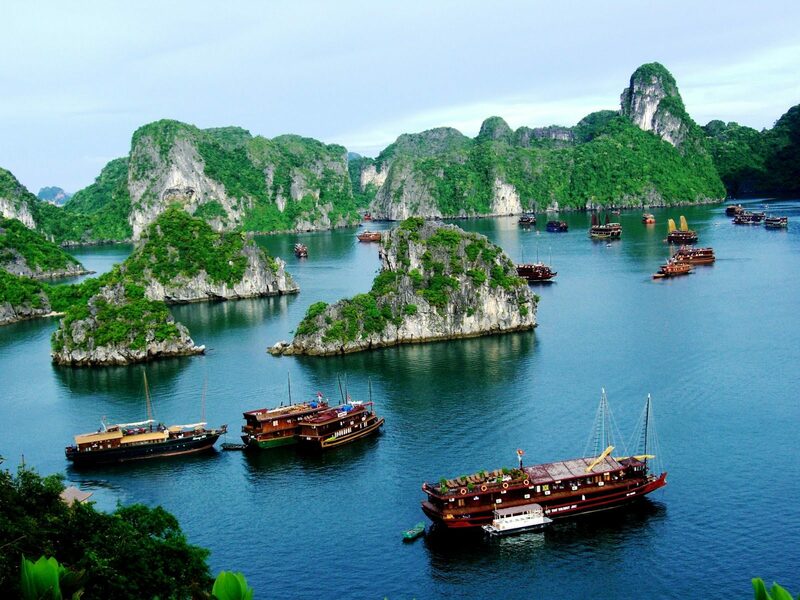 March and April are great months to visit Halong Bay; the weather is not too hot, not too cold and although there are higher chances of rain and increased humidity, it’s easily one of the most beautiful times of year to visit Halong Bay. The pleasant weather, coupled with longer days, means there is more opportunity for outdoor activities. Better still, due to the lack of tourists in this period, there’s more space for you to take in the stunning majesty of the Halong Bay. 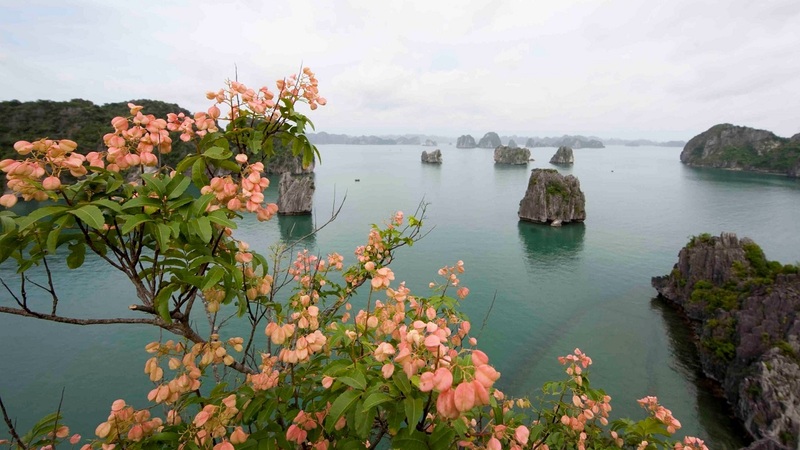 Halong Bay is an explosion of beauty and charm in spring, where orchids bloom and nature flourishes. The air is fresh and sweet, the scenery is breath-taking, and the temperature is perfect. The weather itself creates an ominous yet alluring mist that sweeps through the bay and fills the ancient cave systems, creating a spectacular display at dawn and dusk. One of the major appeals for anyone hoping to get off the sun lounger and into the bay itself is the joy of spring’s increased daylight hours. This gives you more time to get out in the water before watching the sun set over the limestone karsts. March and April receive the most daylight hours of any month in Vietnam, with eight hours of sunlight a day, so don’t miss out. While Halong Bay’s tourism may peak in fall, it tends to drop in the summer, when the weather is at its hottest and stickiest. In spring, however, the climate is optimal, with temperatures ranging from 19 to 24 degrees Celsius and a lot less humidity, though there are high chances of a light, but consistent, drizzle. With Vietnam’s tourism peaking in fall, a holiday in Halong Bay around spring provides a less crowded atmosphere, making ventures off the boat and into the water all the more immersive. On a clear day, you can feel as though you have this ancient seascape all to yourself. Due to the lack of tourism, prices are often lower than other times of the year, making some options more affordable. Landing in April each year, Halong Carnival is the biggest festival in Halong, with a colorful, vibrant atmosphere, thousands of actors, dancers, singers, musicians and students, most of whom are Halong residents. Warming up after the winter chill, spring offers a comfortable temperature, not too hot, nor too cold. This creates the perfect climate for Halong’s many outdoor activities, including rock climbing, biking, kayaking or hiking, all of which you can enjoy even if there’s a sprinkling of rain. While voyaging through the limestone karsts of this ancient seascape, it’s important to take some time to relax and allow yourself to drift through the waters. At President Cruises, we believe the best way to enjoy this magnificent World Heritage Site is on the ship, and that’s why we supply the largest amount of on-board entertainment of any vessel in the bay. Here’s five reasons why we believe cruising is the best part of the journey. On a President Cruises journey, each cabin comes with the perfect place to enjoy the tranquil scenery as it passes by: Your own private balcony or terrace. 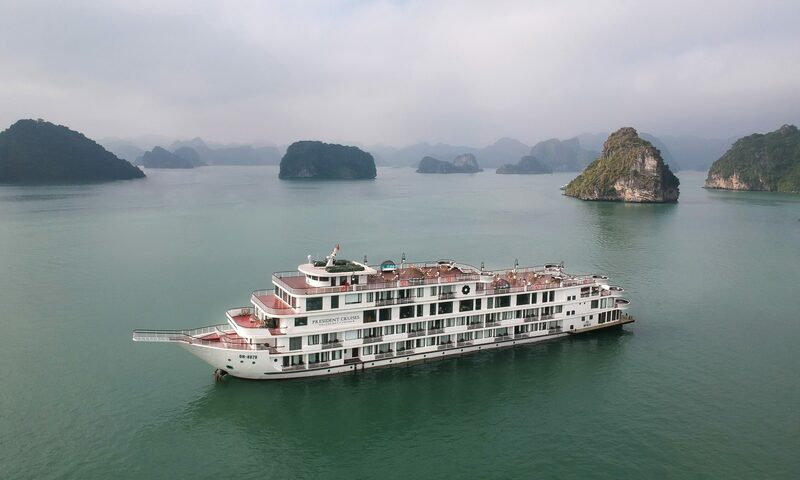 It is hard to imagine the vastness of Halong Bay, but as this ship powers through the waters, you’ll be able to see the dramatic cliffs and micro-rainforests sitting on these small islands. You may even spot some wildlife. The magic is in the changes: Each second you cruise the view is different from the last. 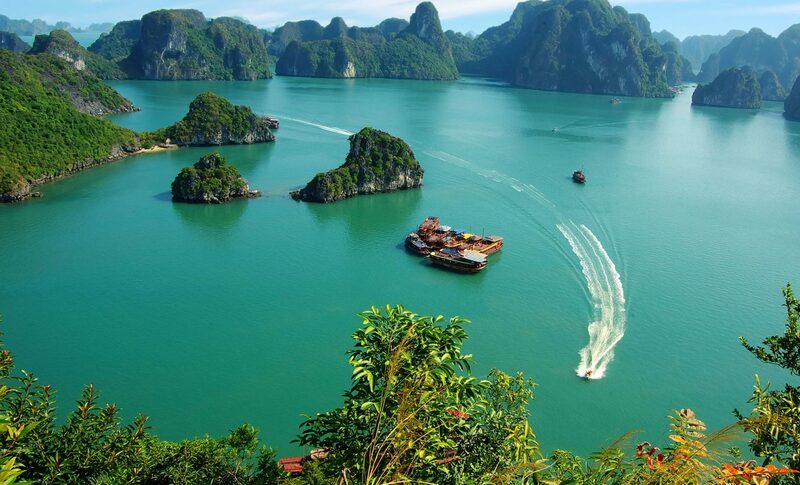 It is easy to see why Halong Bay is one of Vietnam’s top attractions. It’s a stunning destination and a UNESCO World Heritage Site that draws people from all over the world. This can, however, mean that all of those hidden gems that Halong Bay possesses aren’t so hidden anymore. Fortunately, when you step aboard President Cruises, the world of tourism is far removed. As the largest cruise ship to ever venture through Halong Bay’s waters, you’ll be able to marvel at this otherworldly destination while sitting high above the crowds. 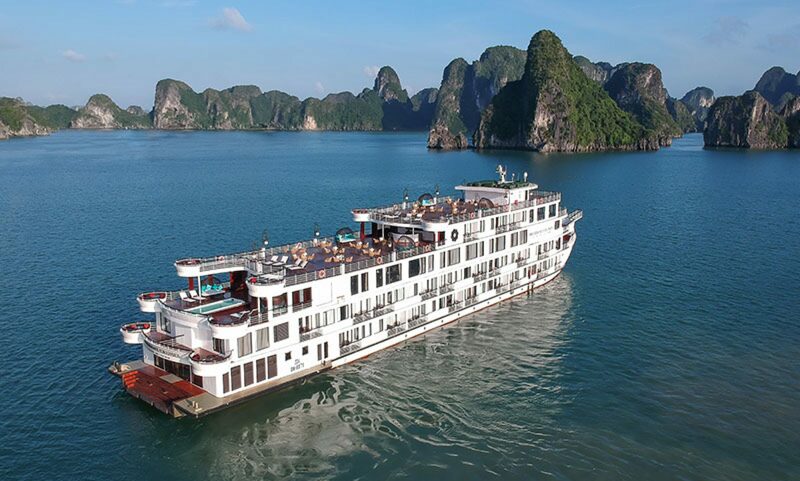 When it comes to a holiday of pampered luxury, there is no better destination than Halong Bay, and there’s no better way to experience it than with President Cruises. Be it lounging on one of our two expansive sundecks, cocktail in hand, or experiencing one of our lavish spa treatments, well-deserved pampering is never too far away. We’ve harnessed the relaxation power of Kaia spa aboard every trip. This esteemed Vietnamese wellness group offers a world-class range of treatments in the ship’s six-room spa. When you climb aboard President Cruises, the number of places to relax don’t stop at your own private balcony or terrace. While this may be the most secluded way of enjoying the sweeping vistas as they pass by the ship, there are plenty of opportunities to find hidden corners. Why not take a leisurely dip in an on-board Jacuzzi while gliding through the bay? Alternatively, take some time to recline on one of our expansive sundecks and watch the sunset, cocktail in hand. We understand that food is an important part of travel. That’s why we’ve worked with Michelin star chef John Burton-Race to curate the only Michelin star menu in the bay. You can enjoy a succulent beefsteak in our glamorous restaurant or chic piano bar, or try the finest in traditional Vietnamese cuisine instead. Cuisine in Vietnam doesn’t get much better than this. How is the Weather in Halong Bay in April? April comes sandwiched between the moderate temperatures of March, which are just escaping the winter chill, and the start of the summer heat in May. Along with an average of eight hours of sunlight a day, which is the highest amount in Halong Bay through the year. 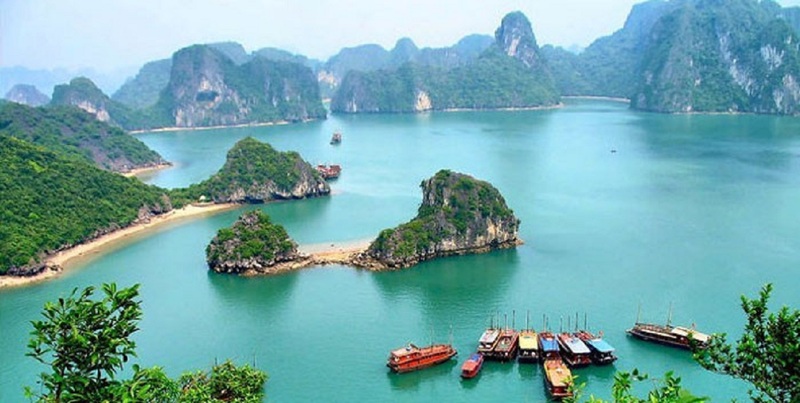 All of this makes a decidedly good time to visit Halong Bay, with great opportunities to enjoy the beach, discover the islands, or take in the outdoor activities. April has a few extra degrees on March, with average temperatures of 23 degrees Celsius. This is an ideal temperature for many, and a good time to enjoy the bay before May, where temperatures climb up to an average of 28 degrees. While highs in April have the ability to reach 28 degrees, the lows only make their way down to 21, making the normal temperature very comfortable and enjoyable. As the temperatures begin to rise, so does the rainfall, with 57mm over an average of 13 days. That number is still fairly dry compared to the summer, where highs can reach 265mm over an average of 16 days. Like March, however, April can experience those long drizzles, where a small amount of rain stretches for long periods, unlike the sudden but brief showers in the summer months. If the idea of long periods of rain deters from sunbathing on Halong Bay’s white sandy beaches, you may find the temperature of the sea in the bay a little more alluring. In April, average sea temperatures reach 29 degrees Celsius, which is the highest in the year, along with December, January, February and March. This makes for a very comfortable and relaxing swimming experience. Overall, the weather in April makes for one of the most comfortable times of year to come to the bay and while this can mean a higher number of tourists, you will have to consider the pros and cons. Fortunately, if you book a cruise with President Cruises, you’ll be far removed from the hustle and bustle of the tourist industry, with our expansive sundecks and on board activities. How is the Weather in Halong Bay in March? March in Halong Bay signifies the end of the cold winter months and the beginning of spring: Temperatures rise, as does rainfall and humidity. The good thing about the weather in March is the higher average temperature. This does, unfortunately have some negative side effects like the longer rainy spells indicative of the warmer months. While this does give the bay an almost prehistoric glamor, it can dampen the adventurous spirit. Halong Bay begins to thaw in March, ushering in warmer weather. Expect average temperatures of around 20 degrees Celsius, with highs of 23 and lows of 18. This is a delightful time of year to spend outdoors, exploring the caves or simply lounging around, providing you can avoid the light showers. As Vietnam is so close to the equator, sunrise and sunset don’t tend to deviate significantly, with seven to eight hours of sunlight a day throughout the year. March is on the higher end of this scale, with an average of around 8 hours of sunlight a day. With March’s mix of higher temperatures and increased levels of rainfall, humidity levels are inevitably higher than the winter months, with around 75% humidity. This is still lower than the average, however, which is 90% humidity for monsoon season. Looking at how much rain falls through March can be misleading. While the average rainfall through the entire month is 53mm over around 13 days, it is more consistent than that of the summer months. This means that, while there is less rain, it continues for a longer period, making it less desirable to pursue outdoor activities. Overall March is a good month to visit. The humidity is low, making activities less tiresome, and the light rains can turn this ancient seascape into a surreal and awe-inspiring picture. Some might find, however, that the consistent rainfall leads something to be desired. There is not a bad time to visit Halong Bay as each season has its own charm, from the atmospheric fog of winter to the bright blue skies of summer. But like much of northern Vietnam, weather in Halong Bay is unpredictable. Here we give you the best guide possible for spring but note that seasonal shifts and freak weather might blow the information a little off-course. Spring is a tricky season in Halong Bay. It starts off chilly and wet, but it heats up quickly as the days roll on and we head toward summer. Winter is over by the end of February and Halong Bay hits summer in May, so spring usually falls in between: March and April. Below are answers to the three questions we get asked the most, with some advice on what to pack. Generally speaking, spring is not cold in Halong Bay. Although the winter chill can sometimes linger from February, temperatures have usually risen to a comfortable 17-22 degrees Celsius. However, note that the sea winds and high humidity levels can make Halong Bay feel colder than it is. 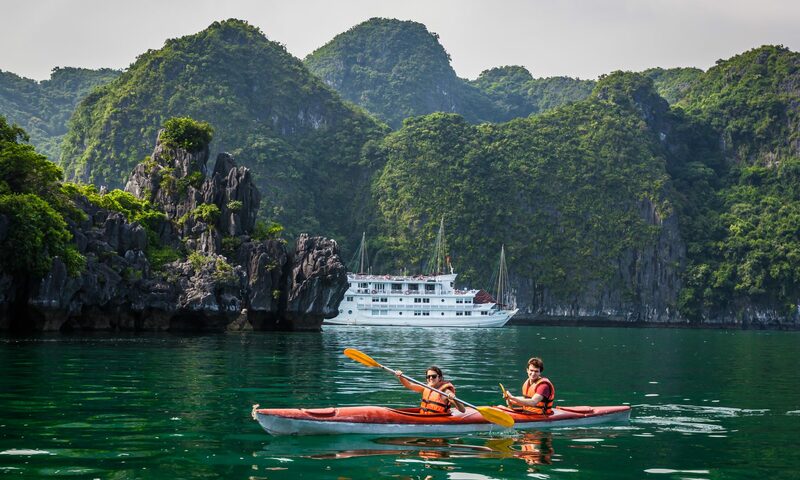 20 degrees may be t-shirt weather at home, but in Halong Bay you’ll need a light jacket. By April, Halong Bay has heated up to a warm 20-25 degrees. This means that this is generally a good time of year for activities, like visiting atmospheric caves and climbing to the tops of mountains. And remember that on President Cruises, we have an outdoor Jacuzzi to warm you up on those cooler evenings. Yes, Halong Bay is humid in March and April. Humidity always makes you more susceptible to the temperature: 15 degrees can feel like 5 degrees and 30 degrees can feel like 40 degrees. Spring is a humid season, which means that you need to check the temperature and pack accordingly. Make sure you have warmer clothes available for early spring and cool, breathable clothing for late spring. All the President Cruises cabins have temperature control, so if you need to cool down, warm up, or escape the humidity at any point during the cruise, simply retire to your cabin and enjoy the views with floor-to-ceiling windows. This is a tricky one to answer as precipitation levels in March and April are generally low: just 50mm of rainfall for each month. To put this into perspective, August, which is Halong Bay’s wettest month, has over 250mm of rainfall – five times as much! But that doesn’t mean that spring is dry. Halong Bay is wet with light drizzle for half of March and over a third of April, so you need to make sure that you bring light waterproof clothing. Although the capacious sundecks aboard President Cruises might not be desirable places to unwind when it’s wet, all the private balconies are sheltered, making them the perfect places to sit back and enjoy the scenery in spite of the drizzle.